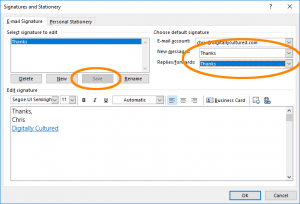 Here's how to create and set your email signature on a couple different programs. 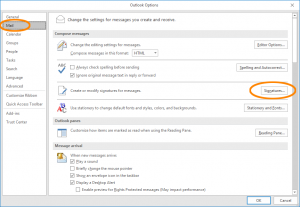 In Outlook, hit File, then choose Options. 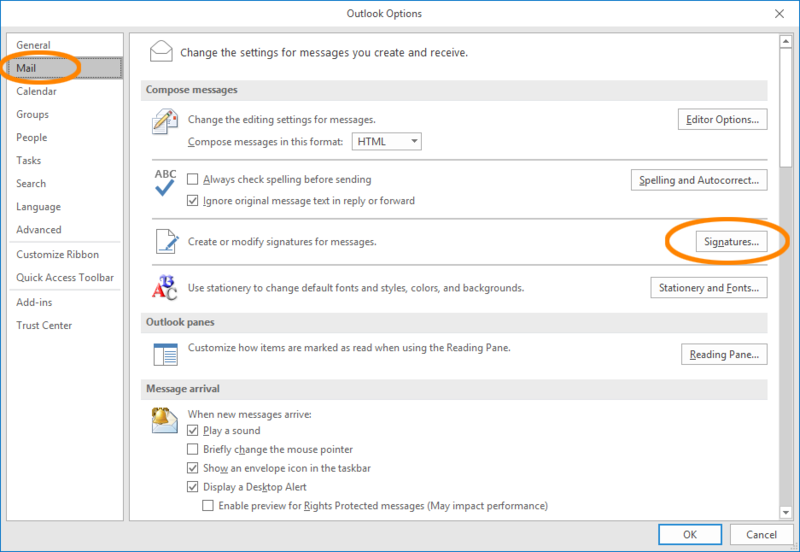 In Outlook Options window that pops up, click “Mail” in the left navigation, and then the “Signatures” button on the right. 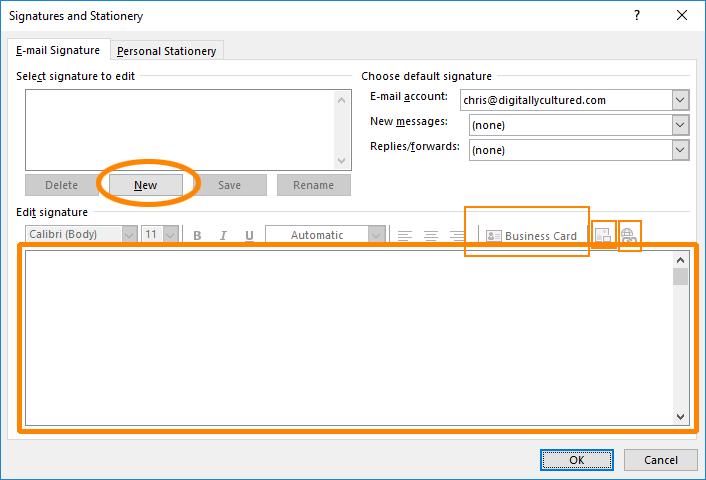 First, you’ll have to create a new signature, and then you’ll have to tell Outlook when to use that signature. 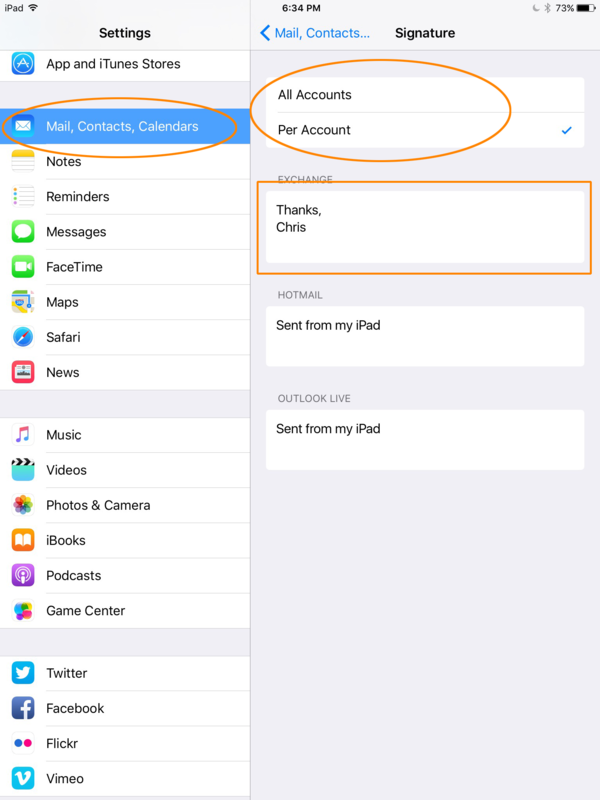 The two options are for composing new emails, and replying to or forwarding an email. To create a signature, click the “New” button. 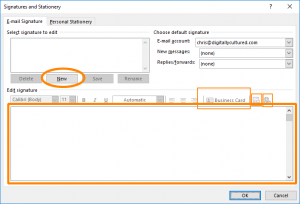 Give the signature a name when prompted and hit OK. In the editing box below, type in what you’d like your signature to contain. You can insert links and images by clicking the respective button. You can also attach your business card (if one has already been created) if you’d like. 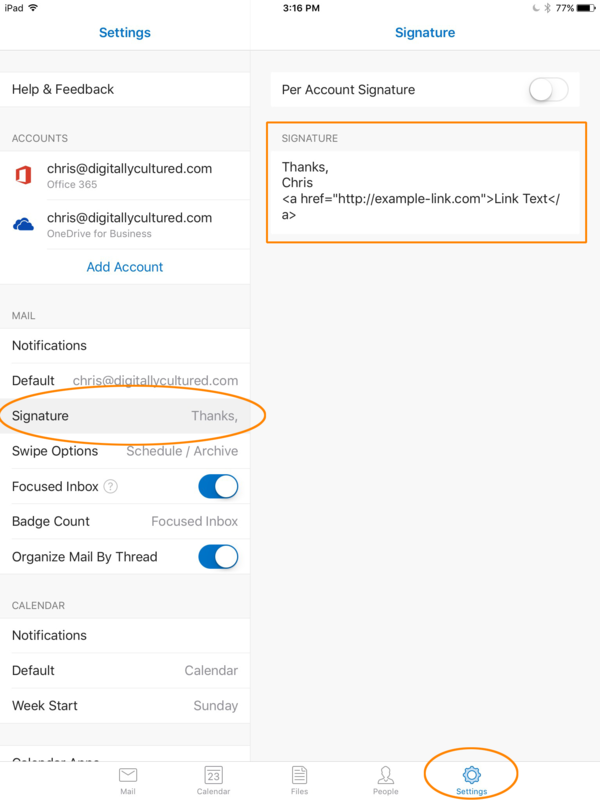 Once the signature has been created, hit the “Save” button in the top left section. You can optionally create a new signature to use as well. 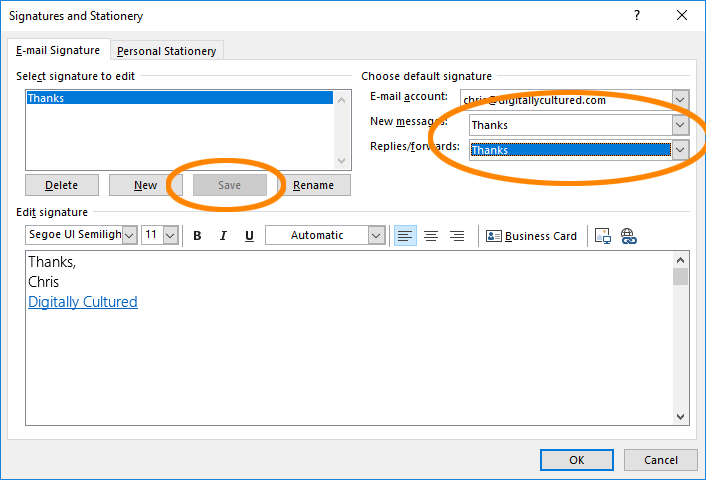 Now, you’ll have to tell Outlook what signature to use in which situations. In the top right section, choose your newly created signature in the drop down for either (or both) “New Messages” and/or “Replies/Forwards”. Hit OK on each window to save your changes until you get back to the main Outlook screen. In the Outlook app, tap on “Settings” on the bottom navigation bar. Once in Settings, tap on “Signatures”, and then you can type in your signature in the “Signature” box. To create links, you can use this format (replacing the words in the [ ] with what you’d like): <a href="[http://your-web-address.com]">[Your Link Text]</a> In this example image, I want the link to say Digitally Cultured, and when someone clicks it, they should be taken to my website (https://digitallycultured.com/). Open Settings. 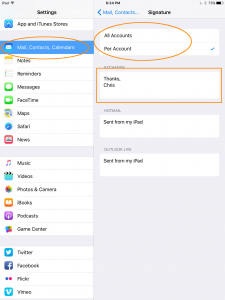 Swipe down a bit and tap on “Mail, Contacts, Calendars.” You can choose to set a signature for every email account you’re using on this device (tap “All Accounts), or a unique signature for each individual email account (tap “Per Account”). 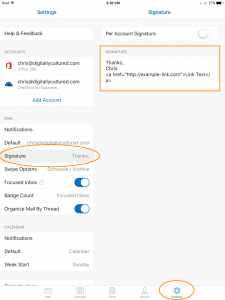 If you choose to have a unique signature for each account, make sure to tap inside the text box for the correct account, and type your signature.